It's time to get all of the tips together and put them to use! I usually don't have posts about specific products, but I received some requests to give more information about how to use some of my packets. Let me know if you like this or not! Look for materials that include multiple skills! I'm using my newest packet to show you some ways that it can be done. 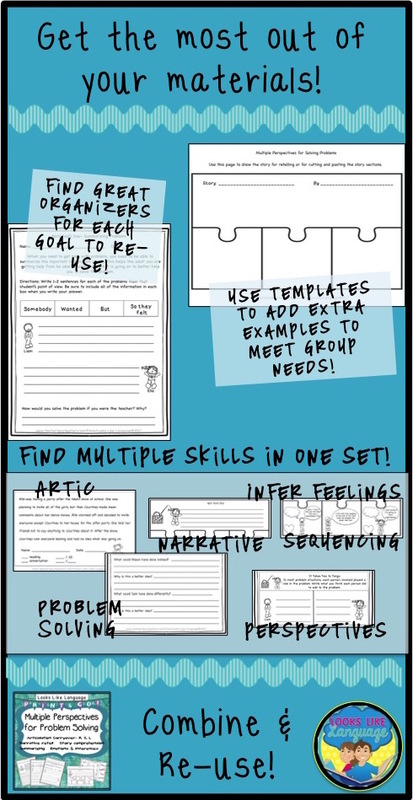 There are language goals (sequencing, WH questions and narrative retell), articulation goals (carryover of R, S, and L,) and social skills goals (emotions, inferring, problem solving and perspective taking) for each short story! 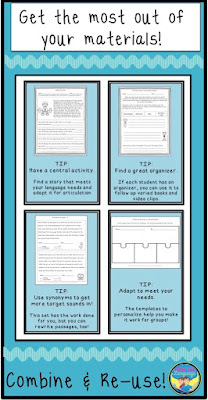 Find a central theme to have all of the students in the group share in the activity. In this example, it is a short story that was designed to work on the social skill of understanding multiple perspectives in a problem. It was developed with an abundance of words that contained one sound (/R/) in all positions to elicit carryover. You can do this with any story or book, though. 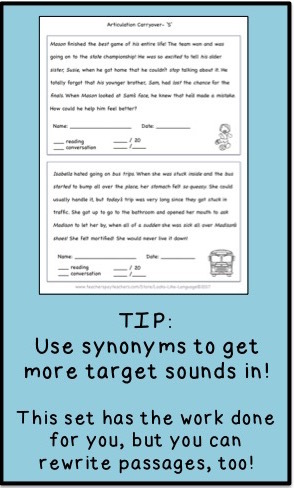 Give your speech sound students a list of words with their sounds that are close synonyms for words in the story. During the first reading, they have to listen and write (or underline if they have a copy) the words that are synonyms. 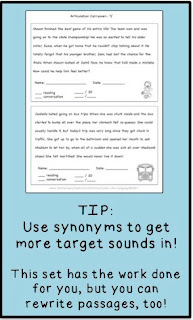 When re-reading or during the activities, they have to substitute the word with their sound for the synonym in the story. Gather an abundance of materials related to that central theme! It is time consuming to find and adapt multiple pages to fit the same theme, but it is possible. Of course, buying one that is all done lets you spend your precious time doing what you love! 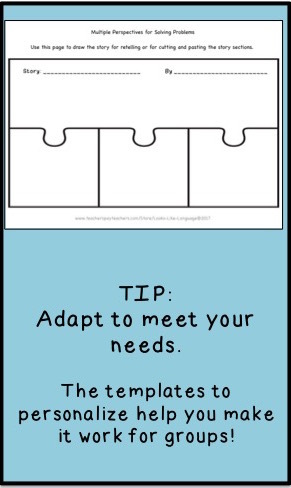 Adapt what you have to include the one skill that may be missing to meet all of the needs in your group! That is why I always try to include one blank template in all of my products for you to personalize. 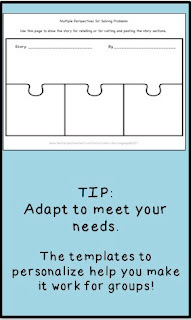 It isn't too time consuming if you just have to write in the work for one student in the group using the same set of game cards or activity template. 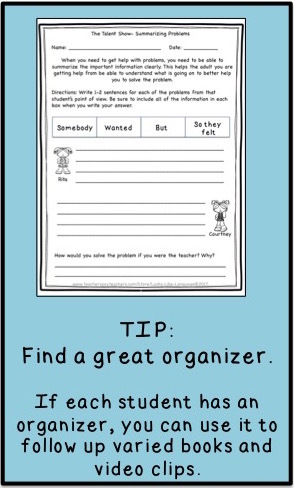 Look for organizers for skills that can be used over again with different books. 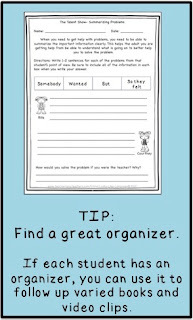 Our students usually need a lot of repetition to gain independence with a skill, so re-use your organizers! Change it up a little by using the organizers with movie clips or wordless shorts on YouTube or try it with song lyrics for older students. Need some ideas? Read this post. If you want to to try out mine to guide you along the way, click here. Enjoy! Are you feeling lucky? If you have downloaded the FREE open ended game at my store, you should be! And since you have come here, you are luckier still to be getting an additional free card set each week until St. Patrick's Day! I've updated and expanded the extra card sets, so once you have downloaded the freebie at my store, click here to get started with the newest version! Quick tips can be so helpful! Whether the information is new to you, jogs your memory, so you can now apply something you already knew, or helps you to see something in a different light, your students benefit! I hope that something in my IG tip series resonated with you! 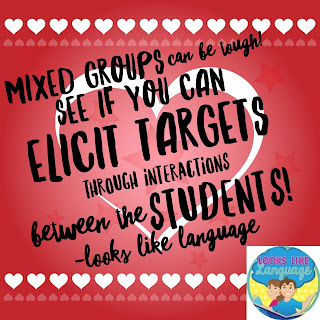 I've circled back around to my topic of mixed groups! It is a reality that we deal with every day, with more success on some days than others. 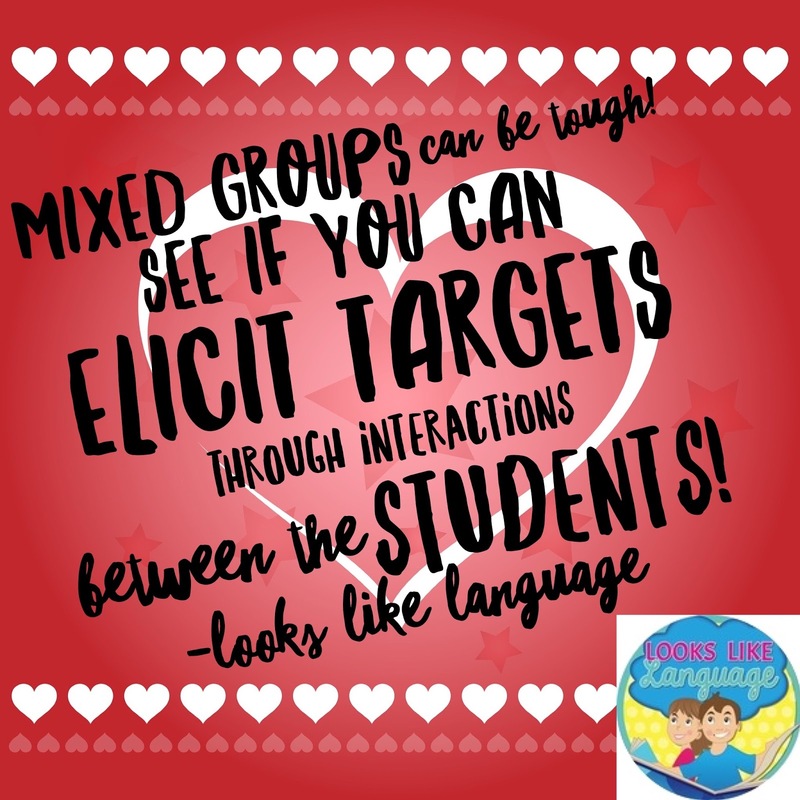 If your mixed group isn't working, try looking at the combination of student personalities and goals that you have in the group. Maybe an unusual combination will work better for you! For more ideas, check this post. Before you change your schedule around, try using some great books to bring your group together! The first time I use a book with a group that has a variety of goals, I read through it and place a sticky note on the edge of the page to remind myself where I can pause to elicit answers from each of the students in the group. As I become more familiar with the book and the various skills I can use it for, I no longer need the sticky notes. For more ideas, read this post. 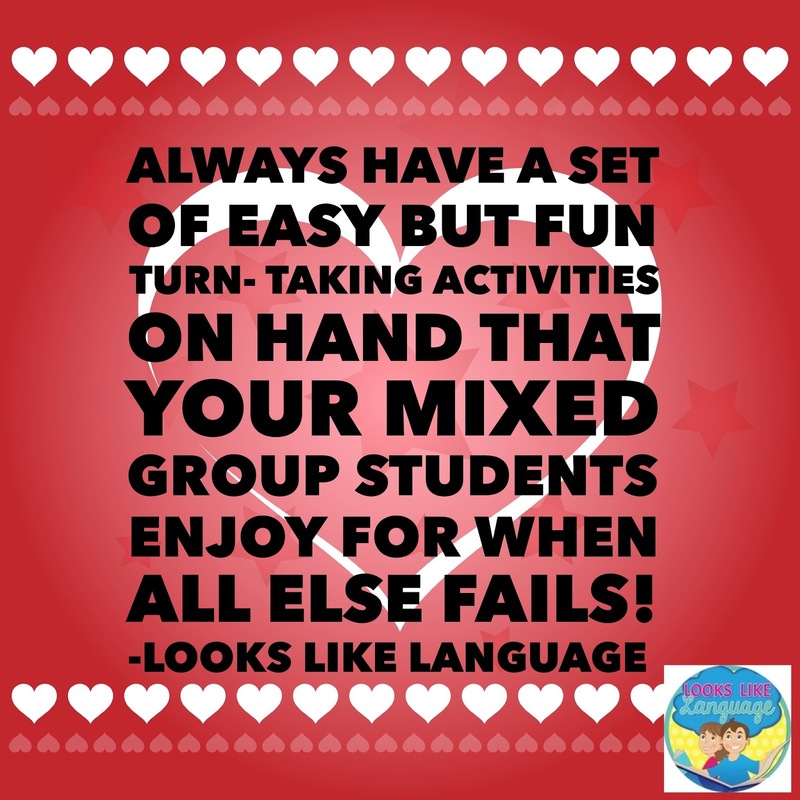 Maybe you just need to foster interactions between your students a little more to get a group more cohesive, especially if you have any students with social language needs in the group. I regularly start my groups by encouraging them to have to have a conversation. 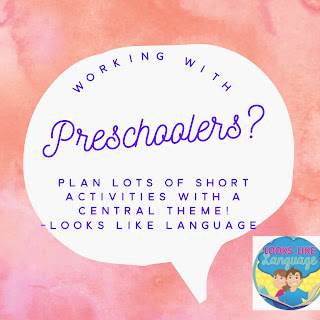 Not only does it give me a few moments to write the attendance and take a quick peek at how they did the previous session, it lets me listen to how they are using their speech/language skills naturally! 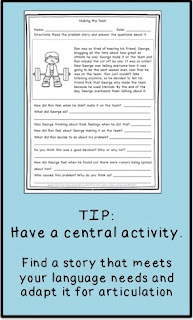 For more ideas on how to use interactions between the students in a session, check out this post. When all else fails, have some fun activities that allow for taking turns ready to go at a moment's notice! 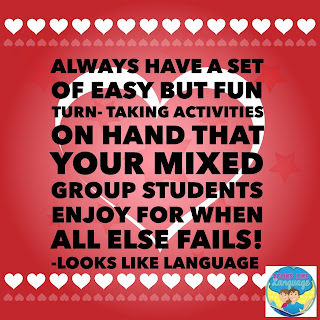 It may not make the group gel, but you can work on each child's skills separately to get through the session if there is an activity in common. Bubbles, playdoh and puzzles will save you with a younger crowd. Elementary to middle school level kids will usually play a board game, a card game like UNO, or watch a video clip and talk about it. Need more ideas? Read here. 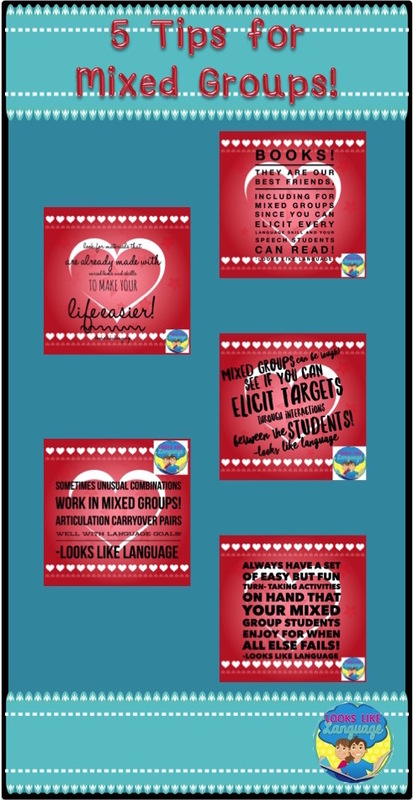 To really make your life easier, get together sets of materials that can be easily used for mixed groups. 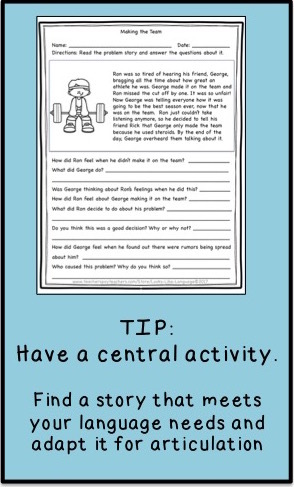 Find a central theme with a variety of activities for different skills that can be used during a week or month. You can scrounge the internet to pull together your own sets, but if you don't want to spend the time doing it or need a little help along the way, check out TpT! I will feature some of my sets that work on multiple skills this month to show you how it can be done. 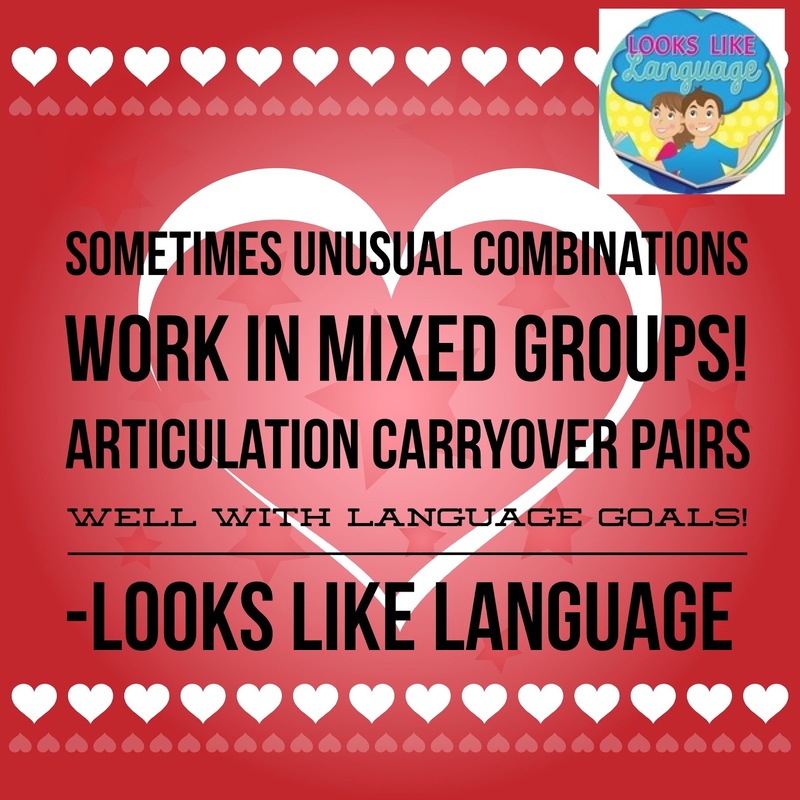 What makes your mixed groups most difficult for you? Looking for a free Valentines Day activity that covers a range of ages? Try out Conversation Hearts! 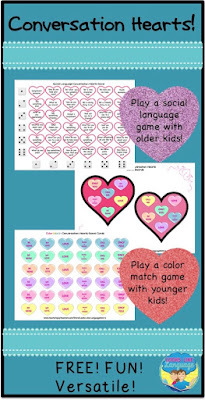 This game can be played as a color matching open ended game to work on any skill or discuss those cute sayings on Valentine hearts candy. Have older kids? Use the roll a die social language game to practice ways to think about and say kind things! 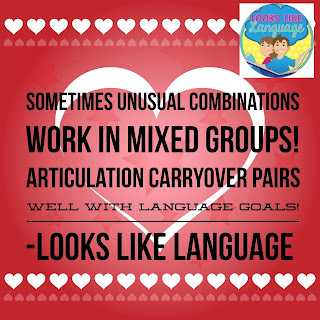 Working on getting group needs met at Looks Like Language! Let's be a #kindnessnation! Have you been following my daily tips on IG this winter? If not, no worries! I'm recapping them here. I've worked with kids from below the 1%ile to the 10th %ile for a while now, but I had a lot to learn when I first got started. 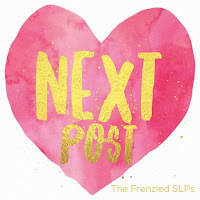 Maybe you know all of the information I've been sharing, but I thought there might be some SLPs out there who don't generally work with such impaired students and might like to see what I've learned the hard way! 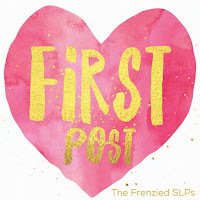 If you missed the last post about teaching kindness, be sure to catch it here since it was a blog hop with links to lots of freebies you can download! 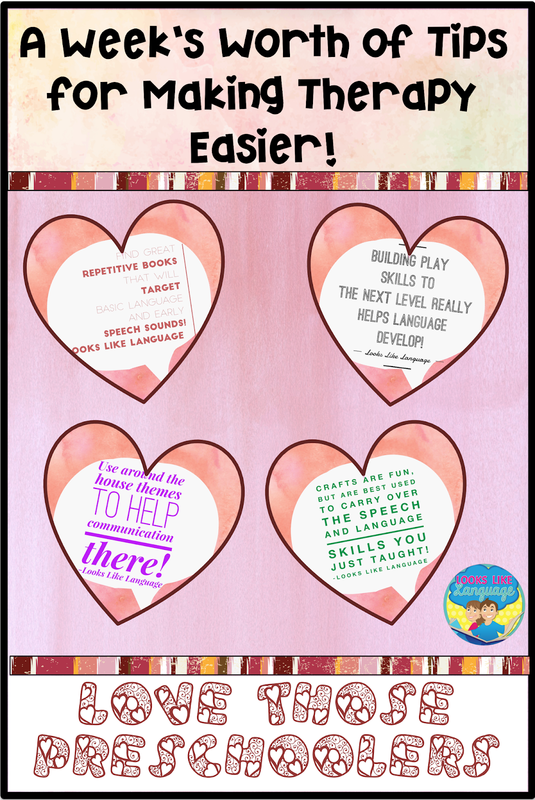 Be sure to check out the tips for autism and for unintelligibility, too! Now for preschool tips. It has been a while since I worked in the full day preschool, but I loved that population! The kids had lots of needs and took a lot of energy, but they were so cute! It is a vital time to provide therapy since you can have such a big impact! Preschoolers, in general, don't have very long attention spans. When you combine this with other learning problems, you'd be wise to have a lot of back up ideas for each session! 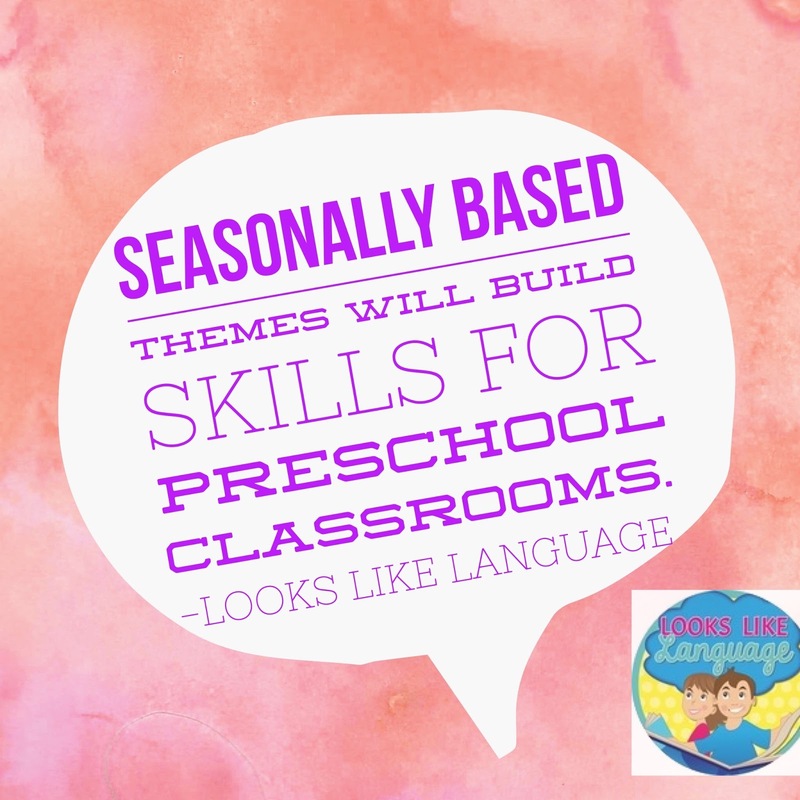 Bubbles, playdoh, and favorite toys seem to be items that all preschool SLPs keep on hand. For my main therapy plan, though, I always tried to incorporate a book as my central theme to develop literacy skills while eliciting language. I tried to find books related to my theme with big pictures and simple repetitive text and plan hands-on activities related to the plot as my go to's. It worked! Having toys related to the story serves several purposes. 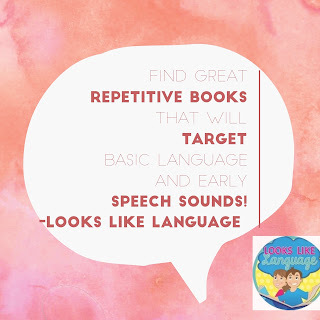 More practice with the vocabulary, sentence structures, or sounds in the words occurs in a natural way. Playing the plot of the story helps kids to understand the language in the book while building play schemas. Connecting books with play helps kids see that books are fun, which is helpful for developing literacy skills. When students understand the language and plot, they become more interested in the book and will attend longer! It is a win-win all around. Have I convinced you yet? 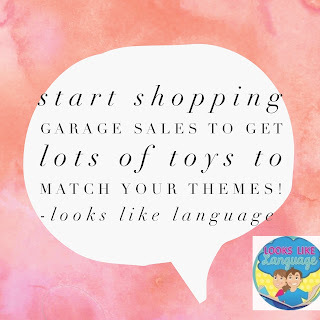 Start shopping garage sales, thrift shops and, of course, the dollar bins at Target to pick up hands-on items that relate to your favorite therapy books! It is so helpful when the books have a repetitive refrain! That is the basic level for understanding and retelling story narratives. Students will remember the refrain and join in, giving that extra practice for speech sounds and language goals. It is easy to play, as it often involves one main activity with lots of characters. Additionally, at this level, the pictures usually match the text exactly, so that your kids will see what they hear and comprehend it more quickly. 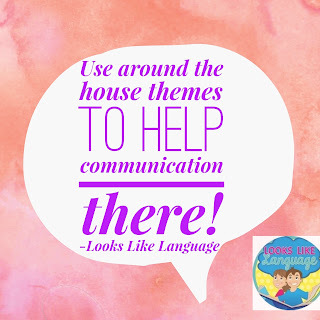 If you are working in a home setting, using a central therapy theme of 'around the house' is a no-brainer. 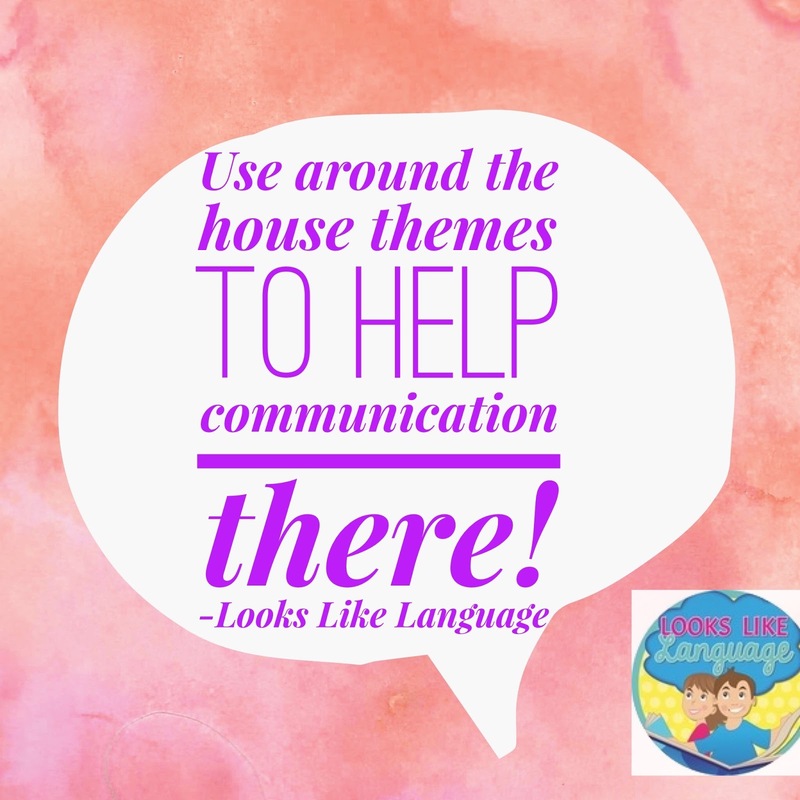 It will help the child be able to communicate better with the family and will let you build carryover with the parents so easily by demonstrating what to say to elicit the skills as part of the daily home routine. In my area, schools switched away from center-based therapy to home-based therapy many years ago just so that the parents could be involved and carry over the skills automatically. 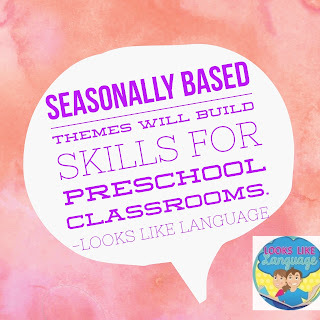 If you are working with young children who go to a preschool, you can't go wrong using seasonal themes. Every preschool I've ever visited uses seasonal/time events as part of their curriculum. 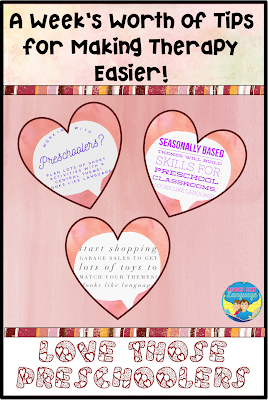 So many skills can be worked on through basic season, holiday and category themes. Time is such a difficult concept for students with learning problems to comprehend! 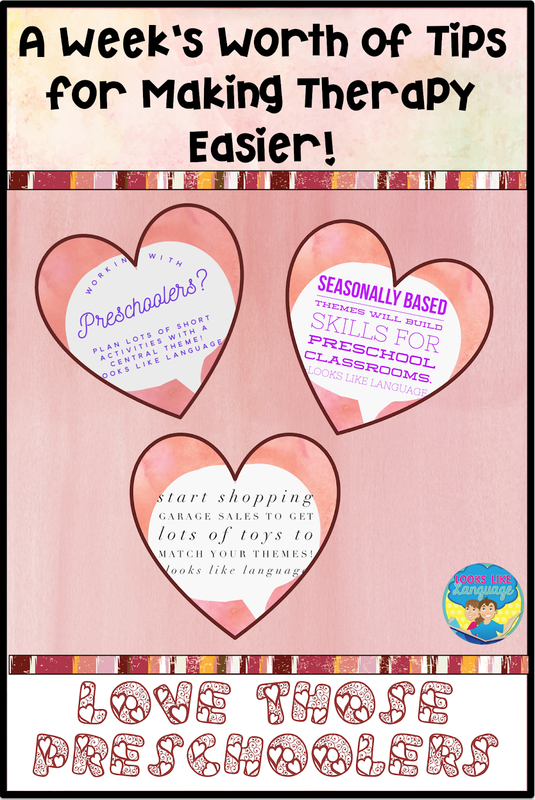 If you really want carryover, try to tie what you are doing in with the theme the preschool teacher is using that week/month. There will be so many opportunities for practice, and it will help your students be more active participants in the activities! 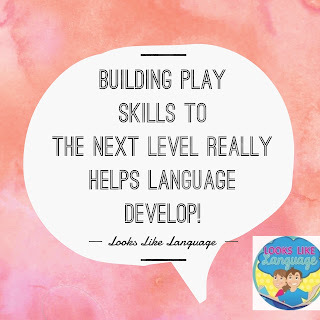 I touched on play skills before, but I can't stress enough how important it is to look at a student's play skills along with their communication skills. 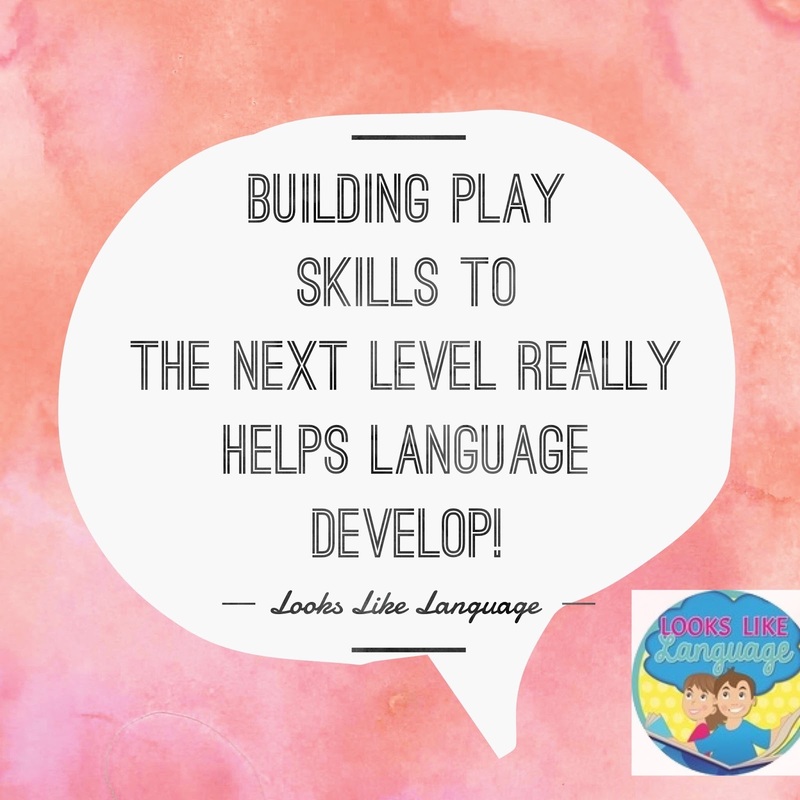 If you see a student with advanced play skills but little verbalization, I would bet you will find that they have more expressive language problems than receptive! 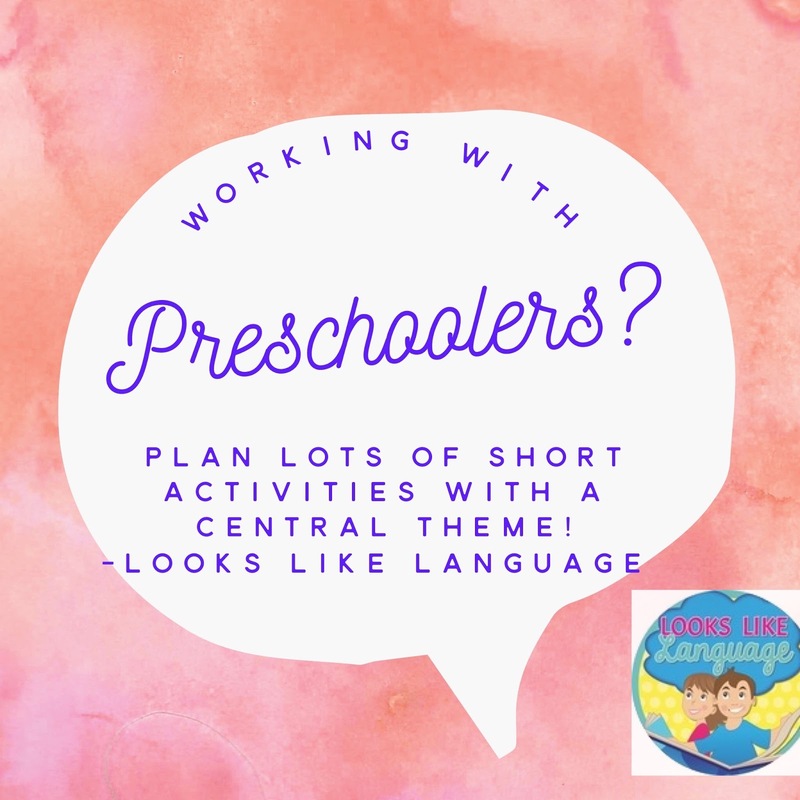 My students in preschool were delayed in multiple areas, so I found it to be a wonderful therapy technique to work on language, articulation and play skills at the same time. It takes a little practice to figure out what you can elicit with the toys you have on hand, but hands-on activities are so important for little ones! The iPad has provided a multitude of fun activities that truly capture children's attention, but it is still important to see what level of play skills your student has. Higher level students are not as big of a concern, but students with multiple problems will not gain a variety of cause-effect and higher level cognitive and language skills only from touching or pressing on a flat surface, from my experience. Balance the apps with the hands on! This one may be controversial to you since we all love our craftivities, but please read on! Higher level preschoolers, with mild delays in a minimal number of areas, will learn when provided the right kind of stimulation no matter what the activity. 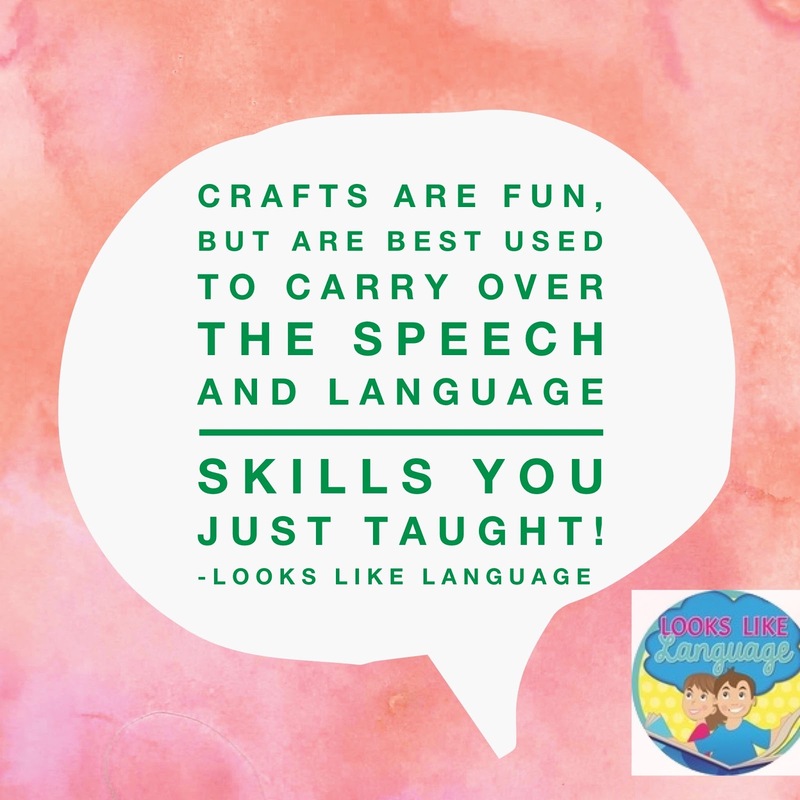 When working with lower functioning preschoolers who have multiple areas of need, making a craft is the icing on the cake that is so fun to use to generalize the skills you have been addressing! When students are very impaired, all of the fine motor skills involved in doing crafts can involve so much of their attention and processing skills that they are not able to do that and learn the language at the same time. Having these students do a craft after they have learned to label, request and understand the language forms involved- well, that is fun and a great way to generalize! Working with preschoolers, you can never have enough visuals! Did you get these FREE room picture labels at my store yet? If not, click here! It is free! It's time to spread some kindness! 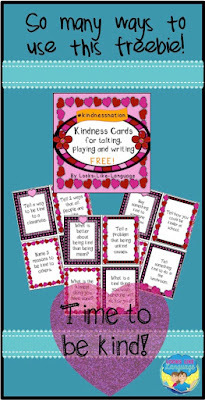 Catch my FREE kindness cards at my store and use them to play games, have a discussion, or do a writing activity! One of my buyers had a great idea for how to use them! So many ways to use this!!! 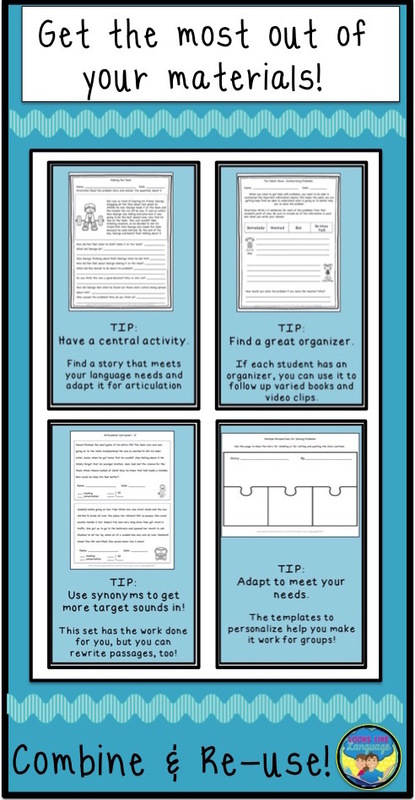 I think I'll paste one per page in a class notebook and kids can pass it around the room and pick one to write about (after reading them all and doing one together). 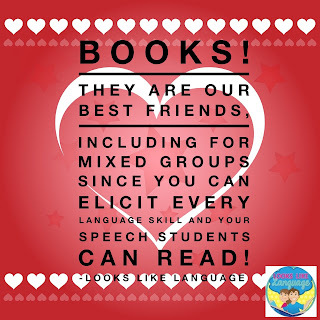 Then kids can add to it or read other's responses in their free time or even silent reading." You could also play a daily discussion round with these cards. Have the first person choose and read a card, with students in the group taking turns providing an idea without duplicating one already said. The next time, start with the person who either ran out of ideas or duplicated a response. See which card gets the most ideas from your group! 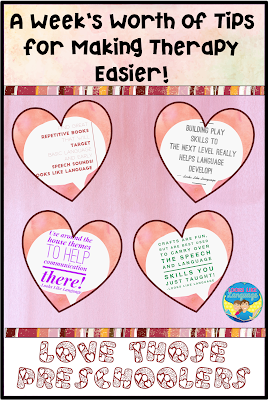 If you come up with a fun way to use the cards, add your ideas to the feedback and share the kindness with an educator or SLP who may need some help with activities! Hi friends! I'm so excited that the TpT Be Mine quarterly sale starts tomorrow! I don't know about you, but I use this opportunity to stock up on new fonts and clipart to make my sets so much nicer for you! 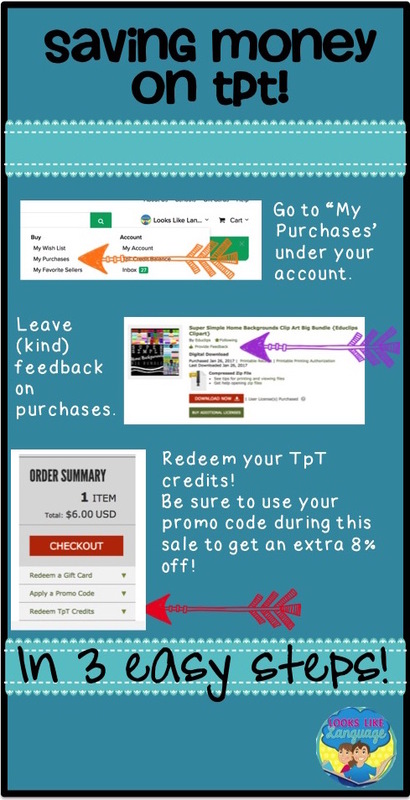 Everybody loves to save money, so I thought I'd give you a quick tutorial on how to redeem TpT credits with this easy to follow infogram. Then, check to make sure that you have provided feedback for all of you have bought. Please remember that we are real people- teachers and SLPs with ideas we'd like to share, not tech gurus. If there is a mistake, or something isn't printing right, please be kind and ask a question in our store first. We want you to be happy! We still want those 4.0 ratings! If we made a typo late at night, blearily trying to get something finished and uploaded after working and taking care of our families, most everyone will happily fix it for you. If it is a tech problem, the tech gurus at TpT can figure it out for us and fix the problem! Click on redeem your credits and you can save! During the big sales each quarter, like Feb. 7 and 8, be sure to click 'redeem code' and put in the special sale code for additional savings. Easy peasy! Have fun stocking up on whatever you need! P.S. The lovely gif is thanks to Lindsey Nagorski, who has some beautiful decor sets you should check out! Labels: SLP Tips, TpT Sale! Kindness in words and deeds truly matters! The Frenzied SLPs are joining together to support teaching and talking about kindness by doing what we know best- making great materials to work on varied speech, language and communication skills! Everyday kindnesses are such an important part of life, smoothing over relationships when we've made an error and apologized for our our mistakes. All too often, my students think that the apology is the end goal. They need to be taught that the real aim is to change their behavior. Showing the person you hurt some extra small kindnesses, along the way to demonstrating that you have truly changed, is also important. To help you out with this, my freebie is a cute little game board that can co-ordinate with the other great materials you will find in this blog hop. 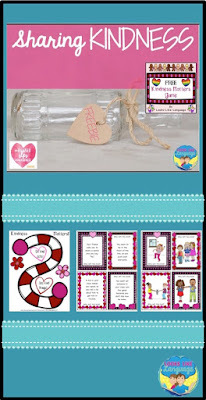 It also includes a set of picture cards to talk about why unkind behaviors and a set with problem situations, too! Have fun clicking through this blog hop to get all of the freebies! 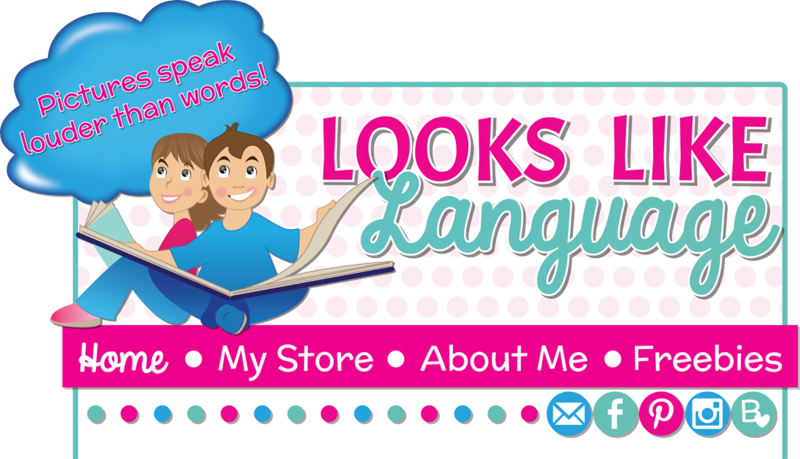 Please leave kind feedback at our TpT stores if you love what we made for you! Thanks to Sparklle SLP and Lisette from Speech Sprouts for organizing us! Link up for the next freebie here! If kindness was ever needed, now is the time! I'm joining the movement at TpT to help spread a little kindness by making it easier for you to plan some activities this month! I also have joined Classroom Freebies! Don't be fooled by the name- go check it out! 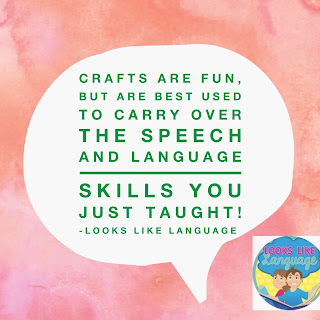 Everything is free, and there are a few SLPs on TpT sharing resources there, including my friends Susan Berkowitz and Lisette from Speech Sprouts! This week, get my open ended freebie from my store. 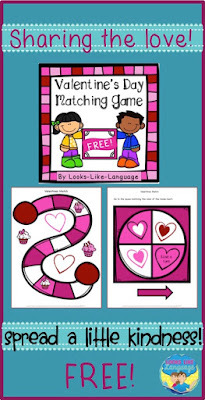 My newsletter followers just got the link to a set of free matching worksheets! If you'd like to join the fun, just sign up using the top bar to get my monthly newsletter. No sharing your email address and no spamming, I promise! If you download the freebie at my store and it makes you happy, please share the kindness by leaving some nice feedback! Enjoy!